Talented Kenyan Girls break through with coding! 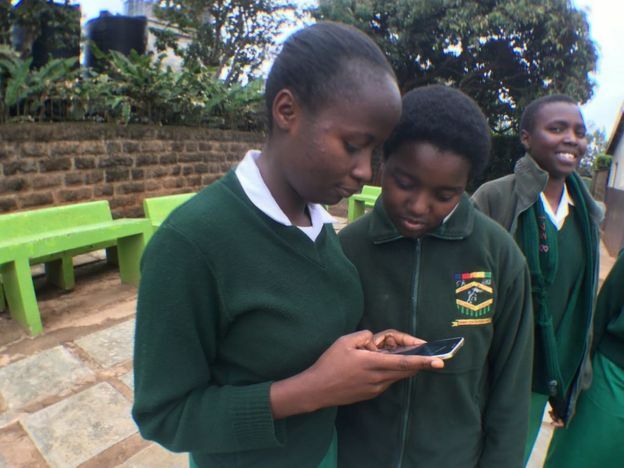 Kenyan schoolgirls are building apps to end ticket queues and transform organ donation, with the help of new mentor programmes promoting women in tech, writes the BBC’s Anthony Irungu. Sixteen-year old Harriet Karanja had been waiting a while in queue to buy a bus ticket in Kenya’s capital, Nairobi, when someone else who was waiting was robbed. They asked themselves whether they could get rid of the queue for the tickets altogether. They called it M-Safiri – which means “traveller” in Swahili. The five, under the team name the Snipers, made it to the finals but missed out on the $10,000 (£8,000) top prize. That went to a group of Mexican school girls who made an app which helps people volunteer to do social work. The experience could make a far bigger impact in their lives than the prize. The girls have plans to transform their team into a technology company once they graduate from high school and are looking at patenting and rolling out the app. This week has been a great one for the Nigerian born London poet Caleb Femi. The poet, English teacher and member of the creative collective Sxwks Caleb Femi, who has just been named the first young people’s laureate for London, is hoping to re-engage disenfranchised young people through poetry. The 26-year-old from Peckham was chosen for the role by a panel including the Poetry Society and the Forward Arts Foundation. He will hold the position for a year, during which time he will set out to give Londoners aged between 13 and 25 a “platform to voice their concerns and experiences through poetry”, said Spread the Word, London’s writer development agency, announcing its choice of laureate. What better film to feature than the film chosen for the opening of this years Film Africa festival which runs from the 28th of October – Nov 6th. (Be sure to attend!) As thousands of students have taken to the streets across South Africa in recent months, calling for wide-ranging reforms, a praise song for Solmon Mahlangu could often be heard. It’s fitting, then, that 2016 should mark the year that his remarkable story finally makes it to the big screen, exactly forty years after the Soweto student uprisings in which Mahlangu played a key role. We meet Mahlangu as a 19-year-old hawker from the Mamelodi township, torn between selling veggies to support his family and joining his friends at the march on 16 June 1976. He skips the protest, but is brutally beaten by a police officer for jumping a train. This incident is a turning point for Mahlangu. Resolute, he goes underground with the ANC to train as a soldier. Mandla Dube’s feature debut is full of rich, sweeping cinematography that takes you right to the action’s nerve centre, and a superb turn from Thabo Rametsi in the titular role. But it’s so much more than this. That South Africans are finally able to watch an anti-apartheid story brought to the screen by a black filmmaker, and told wholly from the black perspective, makes Kalushi a seminal film on the country’s continuing path to equality. Over 75 percent of rural Ugandans travel by walking. Bicycles Against Poverty (BAP) gives people living in remote villages more control over their time and lives with lease-to-own bicycles. These bicycles provide transportation in crucial matters like reaching a health clinic or getting goods to a market to sell. Bicycles increase income by at least 30 percent in Uganda and market attendance triples after owning a bicycle due to more access and time efficiency. To date, BAP has sold over 1,000 bicycles generating an estimated $90,000 of extra income for the farmers who ride them. Synopsis:This memorable, heartbreaking story opens in Addis Ababa, Ethiopia, 1974, on the eve of a revolution. Yonas kneels in his mother’s prayer room, pleading to his god for an end to the violence that has wracked his family and country. His father, Hailu, a prominent doctor, has been ordered to report to jail after helping a victim of state-sanctioned torture to die. And Dawit, Hailu’s youngest son, has joined an underground resistance movement―a choice that will lead to more upheaval and bloodshed across a ravaged Ethiopia.